While we've sprinkled these state park regulations in, here they are in one digestible chunk. Fines for most violations are $110. Not getting a parking pass will set you back $60, and pets not in your control on a leash is a whopping $110, as is making too much noise (see below) in both the day use and Bivy areas. So don't say we didn't warn you...Want the full text from Oregon State Parks and Rec? Here you go. You can park in designated areas only. $5 day use permits are required year-round. Your camping receipt is accepted as a daily permit for the days you are registered. While the park is open from dusk until dawn, quiet hours in the campground are between 10:00 PM and 7:00 AM. Check in time is 4:00 PM and check-out time is 1:00 PM. General courtesy is always appreciated. The official position of the State of Oregon puts it this way---“Activities or conduct which constitutes a public nuisance or hazard”. It goes on to say further clarify this way: “prohibits using or operating any noise producing machine, vehicle, device or instrument in a manner that disturbs or may disturb other park visitors”. A walk-in "bivouac" camping area with a common area for cooking with picnic tables, as well as sinks for clean-up, showers and parking is available. County rules prohibit sleeping in your vehicle. Check out other options here. Pets have to be on a leash no longer than six feet at all times and attended when tied to any trees, fences, rocks or any other object. And yes, their owners are required to clean up after them. Doggie poop bags and a garbage can are found right before the bridge. Snag and toss your stashes—plastic bags actually do not decompose. And sorry, there are no "poop patrols" in the park. Climbers and slackliners bringing dogs to a route or line have special rules. Lastly, to be nice to other pets and humans, yours need to be under control at all times when not in your car. State laws prohibit smoking in all of Oregon State parks except in your campsite or vehicle. This area is a tinder box with dry grasses and afternoon high winds. Please don't take this one lightly. While marijuana is legal since July 1, 2015 in Oregon, it's consumption in public places is restricted. The park is a public place and therefore off limits to using the legal weed where others can see you. What’s Legal Oregon defines all the nuances for you. 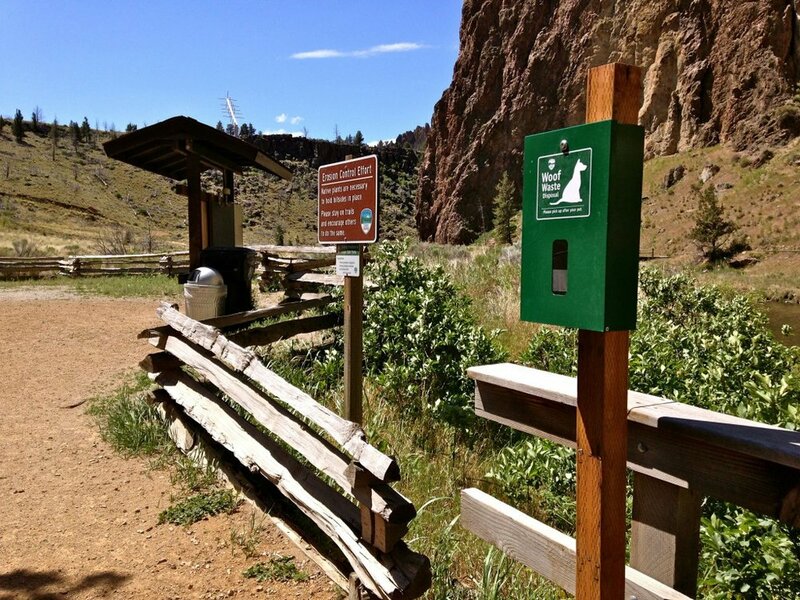 Commercial and recreational use of radio controlled aircraft is not allowed at Smith Rock. This is an effort to control hazards that could negatively affect other visitors or protected wildlife. Bikes are permitted on riverside trails and on segments designated for horseback riding, except for the Summit Trail. (Bikes yes, Horses, no) You can also ride on park roads with the traffic flow. All riders under 16 years-old must wear helmets. Horseback riding, while allowed on most trails in the park, is not permitted on the Summit Trail. The trail crosses private land with a conservation easement that prohibits this activity. The trail is also closed to horseback riding to protect switchbacks from further damage. Additional trails restricted to riding are the misery ridge, ROPE-DE-DOPE, and Mesa Verde trails, and before the horse ford sections of The River and Wolf Tree trails. As of April 3, 2017, there are some new temporary rules in effect as the park finalizes a new Master Plan this year. Tensioned lines must be attended. Lines must be de-tensioned or otherwise made unusable for the general public when not attended. No lines left up overnight. After 24 hours lines will be considered abandoned equipment. Exceptions to the one day rule during nesting season January 1- June 30 will be considered on a case-by-case basis. No slacklines in picnic or camping areas. No lines over designated trails or the river. BE AWARE OF SEASONAL NESTING CLOSURES. Oh, and please observe the special dog leash rules. Hide it or lose it. Note: The park will not be granting written permission at this time. There is a park-specific policy exception: “Equipment used for technical rock climbing, slack/high lining and related activities may be left in day use areas in a discreet manor (not set up but cached). If for any reason park staff needs the equipment removed either park staff or official park volunteers may remove the gear or require the owners of the gear to remove it immediately. Permits are often required for commercial filming and photography. Call the park manager at 541-548-7501 to check if you do. In most cases you will need a permit. Again, call the park office at 541-548-7501. They'll be happy to help.